Discover an ideal venue for your most important meetings and memorable moments at The Lodge at Woodloch. Explore the peaceful, productive environment that's earned AAA Four-Diamond distinction. Surrounded by verdant forests, lush meadows and pristine lakes, The Lodge at Woodloch features elegant event spaces ideal for groups and celebrating life's most memorable occasions. Whether you are planning a girls' getaway weekend, a celebratory milestone or a romantic wedding, the staff will create a completely personalized experience your guests will never forget. Hours: Reservations are recommended for dinner at TREE Restaurant. Allow at least 90 minutes for dinner if you have additional evening plans. Dress for dinner is resort casual. 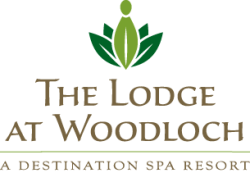 The Lodge at Woodloch is an adult-only resort requiring guests be at least 16 years old. Breakfast is served from 7-9:30am (weekends: 7-10am); lunch is served from 11:30am-2pm, and dinner is served from 5:30-8:30pm (reservations required). To make a dinner reservation, please call (570)-685-8586. Description Discover the ideal venue for your most important meetings and memorable moments at The Lodge at Woodloch. Explore the peaceful, productive environment of this Northeastern Pennsylvania destination - surrounded by the beauty of the Lake Region, within minutes of New York and New Jersey. The Lodge at Woodloch features several unique meeting spaces as well as the flexibility of thinking out of the box for groups. From intimate executive meetings to seminars and conferences, our luxurious destination spa provides the perfect backdrop to inspire your group. Gourmet spa cuisine and 40,000 square-foot spa. Set on over 400 wooded acres with a private lake. Dining: TREE restaurant and bar serves gourmet spa cuisine, sophisticated, artfully presented and graciously served. A diverse menu of creatively prepared gourmet food features naturally-raised meats and fish and organic locally-grown vegetables. TREE’s Chef's Kitchen offers cooking demonstrations, chef-hosted dinners, and special seasonal events including holiday celebrations and old-fashioned barbeques. Golf: Across the street from The Lodge at Woodloch is The Country Club at Woodloch Springs, nationally recognized by GOLF Magazine as "one of the finest courses in America" and rated “4.5 Stars” by Golf Digest’s Best Places to Play. Woodloch’s spectacular, 18-hole, championship, par-72 golf course winds its challenging way over 6,579 yards of fern-carpeted forest, lush wetlands and broad upland meadows. Space Notes The Fireside Room Whether you are planning a corporate presentation or a lavish celebration, The Lodge's versatile 1,350-square-foot Fireside Room at The Lodge at Woodloch is the perfect Northeast Pennsylvania meeting venue for all of your most meaningful occasions. With large, adjacent windows letting in natural light, sweeping views of the lake, and state-of-the-art audio/visual equipment, our Fireside Room is a peaceful and productive space for business meetings, corporate retreats, momentous celebrations, intimate gatherings for groups of 10 to 88 people. The Fireside Room offers a 55 inch plasma HDTV with surround sound, LCD projector & screen, DVD/CD players, microphones, podiums, complimentary wireless high-speed internet, and laptop hook-ups. Enhance your meeting, event or reception with innovative catering by our celebrated chef, who can create custom gourmet spa cuisine for all types of gatherings. Our state-of-the-art meeting facility and suites in Pennsylvania may be reserved for a variety of meetings and events – either in its entirety for larger gatherings or split for more intimate events. Please call for a rate quote for your group's specific needs. Our skilled team of event and group professionals can assist you with each and every detail to ensure a seamless affair. River Birch Board Room An intimate and private room perfect for small board meetings or a break-out space, the River Birch Board Room features a beautiful mahogany table with padded executive chairs, a flat screen TV, bright beautiful windows offering natural light and a foyer area perfect for meeting break spa cuisine.